I tried to holiday through an away game at Blackburn with Wolves. Took me 50 times to fecking beat them finally, lmao. Is that normal? Can't emphasize rotation enough. It has really helped me a lot in FMM18. Ah yes, the demoting thing. Would love to get that fixed. This is actually one of the things I'm not so happy about lol. The whole point of FMM for me is the fast-paced experience. I had no problems with the training from previous FMM versions. If I wanted Bellerin for example to improve his offensive abilities, I'd just set his training on 'Attacking'. It worked for me without reloading skin after restarting the device. Oh wow, my computer doesn't have a Sports Interactive map in Documents. Weird. EDIT: Never mind lol. Do the kits also show up in the Tactics screen? 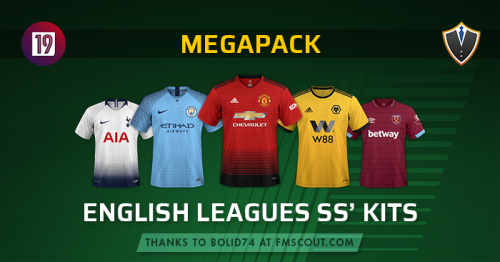 Oh man, it's so great to actually have a pack focusing on the biggest leagues rather than every single club there exists lol. Really looking forward to FMM2019, can't wait to get started with it. What about interested players not being interested at all? It kinda messes up the search results. I don't see any youth coaches either in my saves, both interested/uninterested. I run 1 league only with no expanded divisions on a Galaxy S7 which should still be a powerful enough phone to play the game fluidly. Moving between tabs is a bit slower than FMM17 like I said. It's not annoying, I mean I can play the game quick enough to get joy out of it, I was just wondering if others experience the same game speed as FMM17. Not a bug but is anyone else experiencing a slower game speed? For example, switching tabs is taking like half a sec longer etc?